Here, we explain the flow of transactions. Depending on the address of the customer, our sales staff from 2 areas will respond to the requests of the customers. Firstly, please feel free to inquire by phone, mail, FAX, etc. Based on that, we will give you an estimate if we can meet your requirements. We operate by implementing TECHS which enables us to have a real-time understanding of the progress of products. That makes it possible to adjust the delivery in a thorough manner. "Operating Instructions" inclusive of point-by-point process management are also attached along with the goods ordered. Each factory has its own characteristics such as engineers and equipment; therefore, we do the allocation to each factory after considering the details of the requested product and the delivery date. Further, we place orders to our subcontract plants for wire cutting, grinding, sheet metal products, etc. In addition to general inspection tools such as Vernier caliper, micrometer, gauge etc., we also have electronic microscope, 3D measuring instruments, etc. 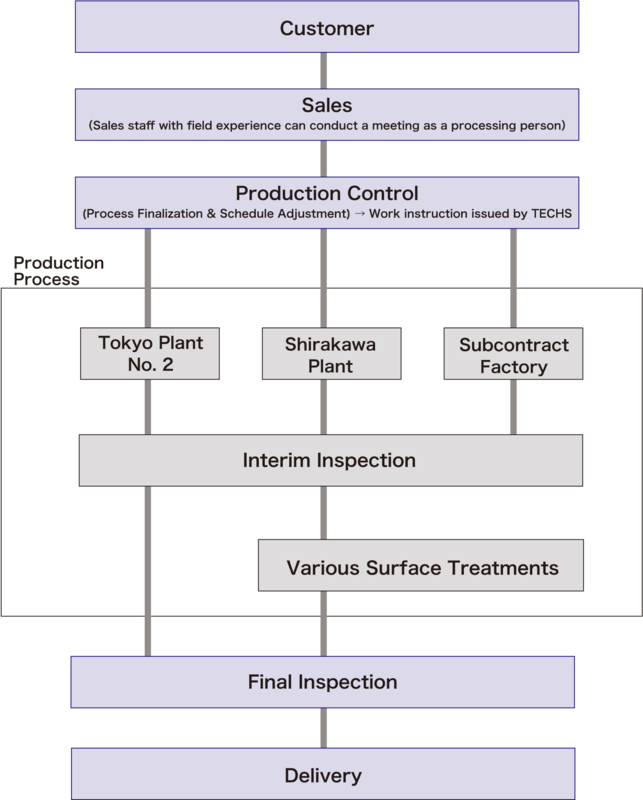 Since Operating Instructions contain process-wise inspection items, respective workers circulate the Operating Instructions to the next process after performing the inspection. Special Inspection Staff conducts the inspection once all the processes are complete. This will be considered as the final inspection if there is no following process such as surface treatment etc. We have subcontract plants for all types of surface treatments such as plating, coating, painting, quenching, etc. We can make arrangements even in case of a special and unproven treatment if we are provided with information. After the surface treatment, the products are subjected to final inspection, inspection of scratches, assembling operations as per the request and then they are packed and shipped. Sales staff will deliver the products by themselves or by using express delivery service. We approach our daily work wholeheartedly so as to ensure repeated orders from our customers even after the completion of transactions.